Why would I need self storage in Sandy Springs, GA? There are a variety of reasons why you might need self-storage in Sandy Springs, GA.
How much is a storage unit in Sandy Springs, GA? The cheapest storage unit in Sandy Springs, GA is $27.00 per month. What size storage units do you have available in Sandy Springs, GA? In Sandy Springs, GA we have sizes that range from 5'x2' to 22'x30' to suit your storage needs. How much is it for a 5'x2' storage unit in Sandy Springs, GA? The cheapest 5'x2' storage unit in Sandy Springs, GA is $55.00 per month. Located on the northern edge of the Atlanta metropolitan area, Sandy Springs is one of the largest cities in the metro area. The city is celebrated for its great location, vibrant culture and thriving economy, offering easy access to the Atlanta area with a high quality of living. Sandy Springs is home to a thriving arts and culture scene, with a number of cultural attractions and events to enjoy. The city has a local museum devoted to Anne Frank, providing educational exhibits and facts about her life and historic experiences. In addition to the museum, the city also observes Holocaust Remembrance Day. If you're interested in learning about the history of Sandy Springs, you can visit the Heritage Sandy Springs Museum. Popular exhibits in the museum include a timeline of Sandy Springs residents, ranging from the earliest Native Americans to present-day locals, as well as photographs of the nearby Barrier Island. The Sandy Springs Artapalooza is a large community event, hosted by the Atlanta Foundation for Public Spaces and Arts Spring. The festival features more than 100 different artists, invited from across the country to display and sell their art. Sandy Springs' largest event is the Sandy Springs Festival, which features an artists market and live performances among other things. Sandy Springs has numerous large employers in health care, technology and business services. Northside Hospital, Scottish Rite Hospital and St. Joseph Hospital provide thousands of health care jobs in Sandy Springs. With the worldwide UPS, Newell Rubbermaid and Cox Enterprises headquarters, Sandy Springs is also a popular place for logistics and business services jobs. Technology jobs are also plentiful, because many large tech companies like First Data, World Pay and Dell SecureWorks call Sandy Springs home. The greater Sandy Springs metropolitan area is home to several industries, the largest of which are trade and transportation, professional and business services, government and health and education services. The Fulton County School System operates the schools in Sandy Springs. There are several magnet charter schools in the city, including North Springs Charter High School (specializing in arts and sciences) and Riverwood International Charter School (an International Baccalaureate campus). You also have the option to enroll your child in one of more than 40 private schools in the area. Utilities: The Atlanta Department of Watershed Management facilitates the city's water system. Georgia Power is the city's primary energy provider, while natural gas is provided by several major companies. Garbage and Recycling: While the city doesn't provide trash collection services, you can receive curbside collection from the private company of your choice. Transportation: MARTA operates the public transit system in Sandy Springs, which includes several bus routes and a rapid transit line. You can also utilize the Xpress commuter lines to access nearby counties. Sandy Springs encourages neighborhood growth and community ties by building a strong network of homeowners associations. If you're planning on purchasing a single-family home, it's important to contact your association to learn about any special information regarding the community. 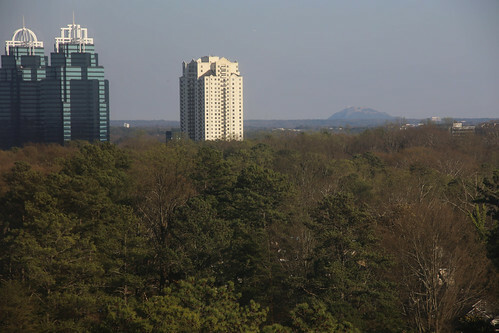 Homes on the city's western side have spacious lots and easy access to Interstate 285, while homes and apartment buildings on the eastern side are more densely populated. Our lowest priced units in Sandy Springs, GA average $51.58 per month. 1239 people have reserved units in Sandy Springs, GA in the past 30 days. There are 26 locations within Sandy Springs, GA's city limits. There are 18 locations in Sandy Springs, GA that offer AC and Heating features.